How much of the Rangers’ record in close games is due to Sam Dyson and the Texas bullpen, and how much is luck? The 2016 Texas Rangers are making history. Their 30-8 record in one-run games gives them a .789 winning percentage that, if it holds up, would set a record for the best winning percentage in one-run games since 1901. But the Rangers have a not-so-slight problem that could haunt them in the playoffs: performance in one-run games is almost entirely — though not exclusively — a matter of good timing and luck, not skill. By all accounts, the Rangers are a decent team. Their run differential is +9, and sophisticated projection models such as FanGraphs’ (which looks at talent alone, not their record so far) would call for them to win 84 games over the course of a full season. Their excellent record in one-run games has helped put them over the top, though. They’ll probably finish with more than 90 wins and the AL West crown, despite the rival Houston Astros posting a much better run differential. Performance in one-run games is notoriously variable. But one argument for the Rangers’ ability to sustain their record-setting mark might be a lights-out bullpen. Closer Sam Dyson has 30 saves, so perhaps the Rangers’ relief corps has earned more of those one-run wins than most teams with a similar record would deserve. The chart above contains two extreme outliers: the 2016 Texas Rangers and the 2012 Baltimore Orioles, the only two teams in recent history with a better than .750 winning percentage in one-run games. In isolation, both performances were extremely unlikely to happen by chance (less than 1-in-10,000 odds), though given the huge sample of seasons we have so far — 2,452 team-seasons in MLB’s history — you’d expect such a thing to happen eventually. One-run performance is messy, but it isn’t all luck. The correlation between a team’s bullpen strength and its one-run winning percentage is significant but fairly weak, highlighting the role of randomness in these situations.3 Just as any given plate appearance can produce almost any imaginable outcome, a game that hinges on only a single run is mostly up to chance. That said, a good bullpen elevates the probability of holding a one-run lead. Add up that edge over the course of a season, and each win above replacement from the bullpen is worth about one extra point to a team’s winning percentage in one-run games. A five-win bullpen upgrade, which could take a team from roughly the bottom 10 percent of MLB bullpens to the top 10 percent, would net an extra five points of winning percentage. Over an average number of one-run games (46 per season), that’s equivalent to 2.3 more wins. If you total up that improved bullpen’s contribution in one-run games and their estimated contribution over the rest of the season (3.6 wins4), that five additional bullpen WAR ends up buying you about 5.9 wins in on-field results.5 This fact may help to explain why relievers seem to be overvalued by front offices relative to the sabermetric consensus. But all of this assumes a top-notch bullpen anyway. 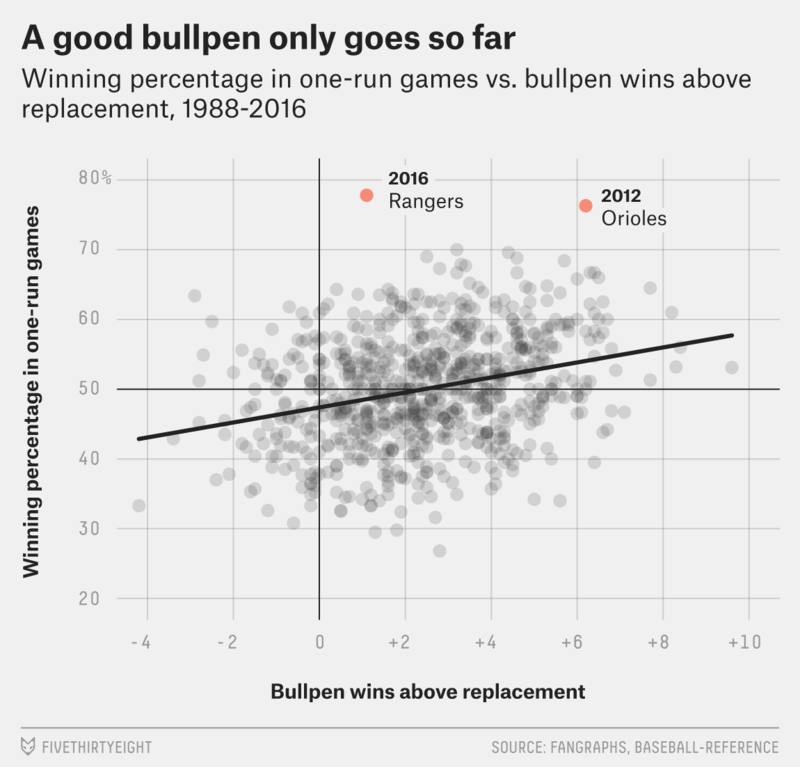 And, surprisingly, the Rangers’ bullpen hasn’t been exceptional — or even good — this year. Although the 2012 Orioles’ relievers produced more than six wins of value, the Rangers’ pen has a paltry 1.1 WAR between them. Based on that alone, we’d expect their record in one-run games to fall below .500. Anchored by closer Sam Dyson and Matt Bush, the top of the Rangers’ bullpen has been fine. But that duo has been dragged down by poor outings from other relievers such as Tom Wilhelmsen and Cesar Ramos. Of course, Wilhelmsen and Ramos are typically used in low-leverage situations, only appearing in one-run games as a last resort. So I also looked to see whether I could explain one-run performance better by focusing on the top relievers in a given bullpen. But counting only the top three or top five relievers didn’t improve the model after controlling for the total WAR of the bullpen. Neither did looking at exceptionally unbalanced bullpens, i.e. those whose top relievers produced much more WAR than their teammates. That doesn’t necessarily rule out the possibility that WAR fails to account for something special that the Rangers’ bullpen might be doing to win one-run games, but league-wide data doesn’t provide much support for that notion. If the Rangers can’t attribute their one-run success to the greatness of their bullpen, to what do they owe it? The answer is timing. The Rangers have played much better when the game is on the line, as measured by FanGraphs’ Clutch score. Their bullpen ranks eighth in the league in Clutch score, but even more impressively, their offense ranks first.6 Combine these two performances and you have a team that saves and scores runs better than any other when it counts. But unfortunately for the Rangers, performance in the clutch is not a stable indicator of success. We need look no further than the 2016 Phillies for proof: Philly dominated the league in one-run games for the first two months of the year, rolling out to a 14-3 record in those contests through May 20th, which would have shattered the all-time mark if it had continued. It didn’t. By the end of the first half, the Phillies’ one-run record was down to 20-9 (which still would have been put them in the top 25 all-time); now they’re at a pedestrian 25-17 for the year, which drops them below the 200th position on the all-time list. The lesson here is that a team’s record in one-run games tends to regress to the mean. The Rangers are more than 90 percent likely to make the playoffs, but they won’t be able to count on this kind of luck in tight contests when they get there. That year was chosen because it is the beginning of the current era of baseball. I used data gathered through Aug. 27, after which the Rangers won two more one-run games. I also tried the same analysis with Baseball Prospectus’ version of wins above replacement and got similar results. The r value is .28. If there are 46 one-run games per season, that leaves 116 other games, or 71.6 percent of the season. 71.6 percent of their five wins is 3.6 wins. 5 WAR of bullpen talent can buy 5.9 wins for a team because of the high-leverage situations in which relievers are deployed, where talent is able to be converted to wins at a greater rate. Their starting pitchers are more average, ranking 13th in baseball.